‘I never saw a circle dance, but I once saw the avenue on Hurston Ridge do something very like it. It was a broiling day after a spell of wet, and a vapour went up from the peaty soil. In the shimmer of this I saw the rows of granite pillars all swaying and bobbing about like people in a country dance, and was quite prepared to see a couple make their bow and go off down the middle and up again.’, (1921, p.32). Hurston Ridge was/is locally known as ‘Husson Ridge’ (Crossing, 1990, p.248) although even that is a far cry from its first recorded name of 1340 which was Hurteston. This has been suggested to derive from the Old English words which are either Harte (deer) Tun (farm) or Heort (personal name) Tun (farm), (Glover et al. 1998, p.426). So you can either have ‘farm of the deer’ or ‘Heort’s Farm’, incidentally, at the northern end of the ridge is a place called ‘Deer Park Corner’ ? Some people talk of Hurston stone row but when one actually looks into things there was during the Bronze Age a fair amount of human activity on the ridge not to mention the surrounding area. Literally the whole immediate landscape is studded with prehistoric remains such as those on Asacombe Hill, Fernworthy, nearby Hameldon, and Shoveldon. As can be seen from the map opposite, Hurston Ridge displays 4 burial cairns, a settlement comprising of 7 hut circles, 2 separate hut circles and double stone row with a blocking stone. The settlement was first discovered by Ian Fleming (no it wasn’t, James Bond was never on Dartmoor, sorry – Andrew Fleming) whilst investigating the Dartmoor reaves, (Fleming, 2008, p.51), it is enclosed by an orthostatic wall which measures 210 metres long and 118 metres wide and encompasses an area of 2.9 hectares. In reality the settlement is enclosed by a three sided wall, the western section is in fact part of the Hurston Ridge Main watershed reave. Inside the enclosure stands 6 hut circles, the 7th is attached to the outer side of the wall, their internal diameters range from 3.5 – 4.0 metres as can be seen from the settlement plan opposite, (Butler, 1991, p.31). There is a theory that larger huts of over 7m diameter would accommodate 4 adults and those below this size probably were designed for 2 adults to live comfortably, (Butler, 1997, pp.140 – 1). Therefore in this case none of the huts are over 7 metres in diameter thus indicating that 2 adults lived in each one except for the hut attached to the outer wall, giving a theoretical population of at least 12 adults. The odd thing about the wall is that it cuts across the stone row which has resulted in it partially lying within the enclosure. This would mean that the stone row pre-dates the enclosure and as is the case with the nearby Asacombe settlement, poses a question. Despite the hut builders totally respecting the early stone row and building around it as opposed to ‘recycling’ the stones it still begs the question as to why? Had the religious beliefs and practices of the people changed insomuch as the ritual row was no longer part of their rites and had become redundant? Maybe the row was no longer in use but some kind of respect for the dead ancestors still instilled enough fear to prevent the monument from being dismantled? By far the star attraction on Hurston Ridge is the double stone row, many Dartmoor authors suggest that this is the best surviving example of such to be found on Dartmoor. 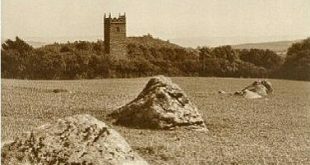 As with many of the prehistoric remains on Dartmoor the row has been subject to ‘restoration’ by Sabine Baring Gould in the late 1800s. As none of the stones were missing this would have been a simple case of re-locating them in their original socket holes and packing the larger ones with stones around their bases. In theory this would mean the work had restored the rows to pretty much their original state. Today the monument consists of 2 parallel lines of stones that run downslope on a slight curve for 143 metres and comprises of 99 stones, 49 of them are in pairs plus a blocking stone at the northern end. In comparison with other Dartmoor stone rows the size of these stones is comparatively small as they average a mere half a metre in height. There seems to be some kind of purposeful placement of the stone pairs insomuch as they are either triangular or flat topped which has been interpreted as representing male and female symbols? Many Dartmoor writers have commented how fortunate these stone rows were insomuch they have been spared the attentions of the despoilers and have not been re-cycled as newtake walls and the like. At the southern end of the stone rows is a much ‘raided‘ cairn which today measures an irregular 6.5 x 7.0 metres with a height of 0.6 metres, at one time there was a visible kist insitu but now that has vanished. It is at this end that the tallest stone of the rows stand, some have called it a menhir or standing stone although in Dartmoor terms it is never classified along with the excepted examples. During the restoration work Baring Gould found a broken stone axe at the foot of this menhir just beside the cairn, and whilst on the subject of finds it is recorded By English Heritage that a cinerary urn was also found in the cairn. The vessel was discovered turned upside down over a small heap of cremated bone which was laid on a granite slab which in turn covered a small pit designed to contain the sifted ashes from a funeral pyre, (Barber in Gill, 1977, p.68). This was recorded as being 18¾” high with a rim diameter of 16″ and a basal diameter of 8″, in 1962 the urn was restored to its original form by Somerset County Museum who described it as, ‘an unusually large and handsome bipartite Overhanging rim or crowned urn of Middle Bronze Age type‘, (EH, 2009, on-line source). It has been suggested that this urn provides a link to Cornwall as similar designs have been found there as well – see photograph opposite. In 1897 R. H. Worth and Sabine Baring Gould excavated a nearby cairn (marked ‘A’ on the map opposite) in which they found a kist that contained small fragments of charcoal and a beaker laying on its side in one of the corners, there was no sign of a human burial. In 1900 members of the dartmoor Exploration Committee excavated the cairn to the south of the stone rows (marked ‘B’ on the map opposite) and once again discovered an upturned urn which was covering a charcoal pit. Clearly there was a distinct form of burial rite occurring in the Hurston Ridge area and more importantly these finds are some of the few artefacts discovered on Dartmoor that provides dating evidence. Just a couple of words of warning concerning Hurston Ridge; if ever you go there you must be prepared to have ponies in your photographs as they love using the tallest stone as a rubbing post and NEVER, EVER, do a Google Image search for ‘Hurston Ridge’ without your safety search switched on! Butler, J. 1997. Dartmoor Atlas of Antiquities – Vol. V, Exeter: Devon Books. Gill, C. (Ed.) 1977. Dartmoor – A New Study, Newton Abbot: David & Charles. Fleming, A. 2008. The Dartmoor Reaves, Oxford: Windgather Press. Torr, C. 1921. Small Talk at Wreyland – Vol. II, Cambridge: The University Press.